My name is Isabella, but my friends call me Bella. I have been competing gymnastics for just over 3 years. I started at level 2 and had an amazing year where I went undefeated. At State Championships, I placed first in all four events and all around finishing with an overall score of 38.725! In my second season, scored out at level 4 and advanced to level XCEL Gold. Through this season, I had learned a great deal with this sport and developed my skill set. With hard work and determination, I progressed extremely well and brought it to the State Championships. I placed first on both floor exercise and balance beam and earned a spot on the Region "8" XCEL State Team! At the Region "8" XCEL Championships, I placed 5th on balance beam and finished 12th All Around. I was honored to be part my XCEL Gold team that finished 8th in the "mymeetscores.com" nationwide gymnastics Top 100 team score! In my third season, I advanced to Level 6 and progress very well. At the State Championships, I placed first on floor exercise and earned spot on the Region "8" level 6 State Team! At the Region "8" Level 6,7,8 Championships, I placed 10th on the floor exercise. At the start of my fourth year, I decided to move to a new gym that is better suited to prepare me with my upward mobility and couldn't be happier! 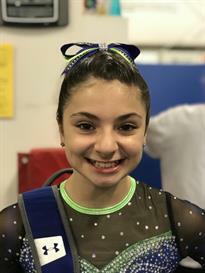 I believe The Brook-lin Center will push me in the direction I need to go to be able to accomplish my dreams of developing into a successful Level 10 gymnast and beyond. Currently, I am competing Level 7 and continue to progress. I am honored to be part of a great organization led by a great a coaching staff who supports and believes in me! I hope to continue on with my passion and love of this sport! I'm a gymnast for Brook-lin Center in Pass Christian, MS. I would love to go Elite or even to College on a gymnastic scholarship. I want to open my own gymnastics gym one day and coach! Excel Gold I am floor and beam State champion. Level 2 Champion on all 4 events and over all. Level 6 Floor Champion and 2nd place over all. I love gymnastics and why some girls dream of walking the red carpet I dream of ruling the blue floor. I have only been doing gymnastics for 3 years! I am Italian and Puerto Rican. I am the baby of the family.